This is the largest version of teh Eartn Flag we stock: 3' x 5' High-Quality, durable Flag with two brass grommets. sublimation-dyed, fade-proof, image on both sides. Dark-blue field with N.A.S.A. 's 1969 first photograph of the Earth taken from space. This image is also available in three other formats: a 2' x 3' Flag, a 2' x 3' vertical banner with a sewn sleeve to insert a pole through, and an 8" x 12" hand-held flag on a wooden dowel. 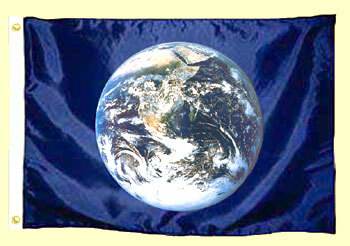 All Earth Flag items are made in the U.S.A.
2' x 3' High-Quality, durable Flag with brass grommets. sublimation-dyed, fade-proof, image on both sides. Dark-blue field with N.A.S.A. 's 1969 first photograph of the Earth taken from space. This image is also available in three other formats: a 3' x 5' Flag, a 2' x 3' vertical banner with a sewn sleeve to insert a pole through, and an 8" x 12" hand-held flag on a wooden dowel. All Earth Flag items are made in the U.S.A. Same image of earth as on the 2' x 3' Earth Flag, with the image rotated 90 degrees, so north is at the top of the banner. The banner has a sleve sewn along the top 2' horizontal length, to slide onto a diagonally mounted flagpole, or to slide a wooden dowel through for vertical display on a wall. 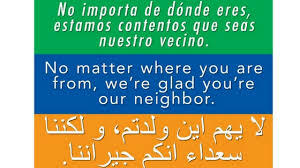 This banner does not have brass grommets, which the 2' x 3' and 3' x 5' Earth Flags do have. Made in U.SA. Same image as on other versions of the Earth Flag/Banner (see above descriptions). This one is the small, hand-held version: 8" tall by 12" long. attached to a 3/8" diameter dowel, to wave by hand or push into the ground. Made in U.S.A. Similar to the banner above, this smaller version has seven - 7" square flags. This compact "mini" version of the banner shown above has seven flag panels -sewn together on a string. This more compact version is more versatile because t can be displayed in many smaller places. The brilliant, hand-batiked banner also uses permanent dyes. It is $12 less than the full-size version, and about half the length (5.5 feet long). Designed by Amara Karuna in Hawaii and introduced in July 2009. This smaller size can easily be displayed above and behind a standard six-foot long table, or displayed in a small dorm room, on a deck, in an office, cubicle or classroom. It also will fit nicely strung across the inside of a car, truck, camper, RV or minivan. IF you need wire frames for 14" x 22" yard signs you already have, you can order extras here. Heavy guage steel wire frame/stake for 14" x 22" yard signs only. Price is for each one. The wire frame easily pushes into ground, gravel or snow. The yard sign slips easily over the top onto the frame. Because the overall dimensions of the wire frame (20" wide by 34" tall) are so large, we bend the legs 90 degrees into the frame so it can ship more compactly. Made in U.S. Just bend wire frame legs out upright to use. The price includes the over-sized heavy duty 18" x 25" fiberboard mailing envelope. Rainbow Flag: 16" x 24"
16" x 24" Sturdy, nylon sewn (not dyed) small flag with brass grommets. Heavty-duty for outdoor use. Made in U.S.A. This smaller size can be flown on a vehicle antenna, bike, motorcycle or boat. 2' x 3' rainbow design, sewn nylon, with brass grommets. Made in U.S.A. Each band of color is stitched together using heavy-weight rip-stop parachute-quality nylon. This is NOT one of the cheaper, imported, light-weight dyed fabric type of flags. 18" x 24" • Wire "H' stake • Union printed in the U.S.
• NOTE: Shipping cost is higher than the amount automatically estimated by the website ordering calculator. We charge only the actual shipping cost to your location. 3' x 5' durable nylon double-stitched flag with 50 embroidered white stars on blue field and six stripes of rainbow colors • Hybrid combination of the rainbow flag with the U.S. flag • Also available in 3 other sizes: 2' x 3'; 4' x 6' and 5' x 8' • Vibrant Rainbow Colors sewn together and double stitched • Canvas Header • Brass Grommets • Made in the U.S.
• Click on title to see a photo of the flag hanging diagonally on a flag pole. 3' x 5' rainbow design, sturdy, sewn nylon, with brass grommets. Made in U.S.A. Each band of color is stitched together using heavy-weight rip-stop parachute-quality nylon. Made in U.S.A. This is NOT one of the cheaper, imported, light-weight dyed fabric type of flags.